As one of Toronto's most vibrant multicultural neighbourhoods, Christie Pits is currently experiencing a rejuvenation. Historically it has been a transitional home for immigrants upon their arrival to Toronto. 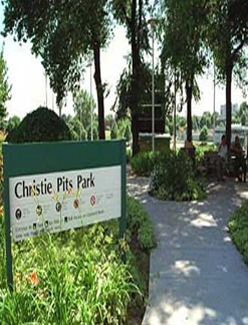 However, as Christie Pits has grown and matured, it has become a destination neighbourhood for families looking to raise children against the back drop of one of the city's best parks, Christie Pits Park. Another draw is the commercial strip along Bloor St. W known as Bloorcourt village with its diverse mix of specialty shops, fruit markets, and restaurants. The houses in Christie Pits were mostly built between 1906 and 1930 and encompass a healthy mix of detached and semi-detached houses which are modest in size with narrow lots. The architecture throughout Christie Pits is a reflection of its working class constituents who have inhabited the neighbourhood throughout the years.